Spot resin trading remained healthy as the month transitioned from Oct to Nov on Wed, though completed volumes fell off the very rapid pace enjoyed over the previous few weeks. There were special month-end deals and some took advantage, then towards the end of the week, fresh railcar offers were rare which helped earn commodity Polyethylene grades a penny gain on Friday. 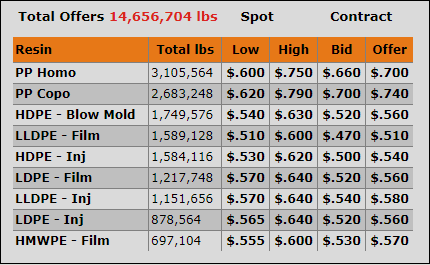 Polypropylene offers continued to flow and spot values fell a hefty $.03/lb - while the PP market is far from awash in resin, rapidly eroding PGP costs point to a sharply lower contract settlement for November monomer. There are also price increases on the table for November resin contracts – producers are generally seeking to add $.03/lb to PE contract levels. At least a couple PP producers are looking to expand margins by $.02-.03/lb, in other words, not drop resin prices as much as the decrease in their monomer costs. The major energy markets were mixed as the Oil complex continued its recent downtrend while Nat Gas finished on a positive note. Dec WTI Crude Oil futures pulled back another $4.45/bbl this past week to settle at $63.14/bbl, a staggering decline of $13/bbl in the past 4 weeks. What a turn of events it has been as fears of Iran sanctions, which had previously been reason to rally, have, for at least the moment, been abated by concern of oversupply. It seems the threat of surging oil prices could now be on the backburner as the U.S. has provided several key buyers with temporary waivers from Iran oil sanctions. Brent Oil saw a similar price break, and the Dec contract ended the week down a tad more than WTI, losing $4.83/bbl to $72.83/bbl. Dec Nat Gas saw a mixed week and ultimately ended near the top of the recent range, gaining $.059/mmBtu to $3.284/mmBtu. NGL prices remained pressured, but slowed their descent after a brutal October. 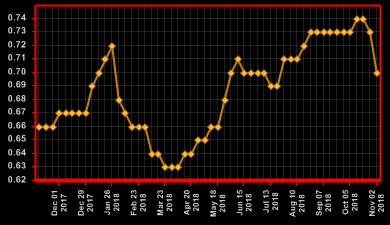 Ethane prices eased another cent to $.31/gal ($.13/lb). Propane fell further, shedding nearly a nickel to $.815/gal ($.231/lb). The monomer markets were fairly busy and the key products, Ethylene and Propylene, moved in opposite directions. The week began with a small uptick for Ethylene and additional losses for PGP as October rolled off the board. Ethylene briefly traded above $.20/lb, up a cent, before easing back to $.195/lb. PGP had another dramatically bearish week as the market continued to erode; offers were shown and bids were hit as prices spiraled lower. Come Friday afternoon, the market had finished around $.46/lb, down nearly $.04/lb for the week, more than 7%. 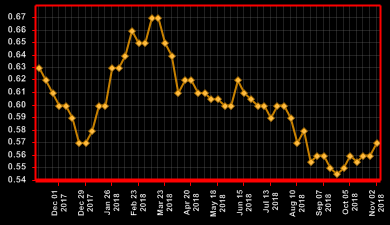 October PGP contracts settled at $.60/lb; spot levels have fallen about $.09/lb in just the past 2 weeks and we expect a sharp contract decrease for November, now estimated at a dime or even more. Spot Polyethylene trading was solid, not quite the heavy turnover we had seen over the past several weeks, but nonetheless it was an excellent cap to a superb October. LLDPE and LDPE film grades, as well as HD injection, continued to shine as pockets of low priced offers quickly came and went into month-end. Although November began with less buyer enthusiasm, we anticipate good transactional volumes to resume. Suppliers were also quieter towards the end of the week, and the lack of offers earned a penny gain across all commodity grade Polyethylene resins. Spot prices have lifted $.01-.03/lb from this cycle’s low, which has helped to somewhat shrink the gap between elevated contract pricing and the deeply discounted spot market. October contracts had rolled flat and producers will give their average $.03/lb increase another try in November. While implementation might be a tall order at this time, the nomination could help hold the contract market steady, rather than give up a decrease. On the bear side, sharply lower Crude Oil pricing, which is top of the feedstock chain for much of international Polyethylene production, has started to sap export demand. If Oil continues to fall and bearish sentiment accelerates worldwide, export demand and pricing could soften and generate another wave of lower priced offers. Houston area warehouses are already largely full with material and pickup appointment times have been extended. Spot Polypropylene trading was a bit slower; buyers, eyeing plummeting feedstock costs, have backed away from the market or at least reduced purchase volumes. Material availability increased for both HoPP and CoPP and prices stepped lower during the week, ending down a large $.03/lb. In a world of instant gratification, some buyers are already expecting the potential dime decrease in Nov PGP monomer contracts to instantly and fully transfer downstream in the form of much cheaper PP resin prices. However, Polypropylene supply and demand are relatively well-balanced and few suppliers appear to be caught with burdensome amounts of uncommitted material. Indeed, there is some lower priced resin already entering the marketplace, but those buyers that need PP resin delivered in the near future should expect only modest and then soon moderate price relief. PP producers seem to already be looking at the cost decrease as an opportunity to expand margins by lowering resin prices a few cents less than monomer drops. As long as it is substantial, few buyers complain that the price relief is not enough. It will be interesting to see how this market plays out in November.